While feeding within fruit bodies, invertebrates inevitably ingest spores. Passage of spores through guts can result in considerable damage resulting in failure to germinate, for example, Agrocybe sp. after passage through the gut of earthworms (Lumbricus terrestris; Moody et al., 1996). Some Collembola completely break open spores during gut passage, for example, Hypogastrura spp. feeding on cultivated Hypsizygus marmoreus, though damage varied between Collembola species (Nakamori and Suzuki, 2005a, 2005b). Those species with greater spore-breaking capabilities were more commonly found in the spore-bearing regions of fruit bodies of saprotrophic and mycorrhizal agarics, compared with those with lesser abilities that were found elsewhere in fruit bodies. The morphology of fruit bodies can be altered as a result of the presence of invertebrates: some Diptera cause galls, enclosing larvae, in long-lived fruit bodies (e.g. Peniophora cinerea, P. limitata and Ganoderma applanatum) and even occasionally in fleshy agarics (e.g. Panaeolina foenisecii and Panaeolus acuminatus (Hanski, 1989; Spooner, 2003)). Moreover, the reproductive fitness of the fungus can be affected by mycophagy in fruit bodies. Both field surveys and experimental studies indicated that ciid beetles significantly decreased the area of functional hymenium of Trametes versicolor: Octotemnus glabriculus and Cis boleti caused reductions of 58 and 30%, respectively, in experiments (Guevara et al., 2000a, 2000b, 2000c). Production of inhibitory chemicals (Feofilova, 2001), physical structure and phenology (Chapter 5) of fruit bodies are likely to have evolved, at least partly in response to mycophagy. Mycelia growing across the surface of soil can be completely destroyed by high intensity invertebrate grazing, but less intense grazing can result in dramatic changes in mycelial growth and activity (e.g. Kampichler et al., 2004; Harold et al., 2005; Bretherton et al., 2006; Tordoff et al., 2006; Wood et al., 2006; Figure 1). Despite the plethora of studies on fungal-invertebrate interactions, only recently has attention turned to saprotrophic Basidiomycota, and then largely to cord-formers (Chapter 1) grazed by Collembola. Mycelial morphology and foraging patterns often change dramatically as a result of grazing, changes varying depending on fungal species (Tordoff et al., 2006; Figure 1), resource status (Harold et al., 2005), grazing intensity (density) and invertebrate (Collembola) species (Kampichler et al., 2004). For example, Folsomia candida had a large impact, Proisotoma minuta often a similar impact, but Protaphorura armata often had little impact (G.M. Tordoff et al., unpublished). All Collembola species tested modified Phanerochaete velutina and H. fasciculare morphology, that of Resinicium bicolor was markedly affected by F. candida, but not by other Col-lembola, and effects of grazing on Phallus impudicus were negligible. The extra-resource foraging mycelium of H. fasciculare, for example, changed from slow, dense exploitative growth to less dense explorative growth during grazing. There were often points of more rapid outgrowth as cords with a fanned margin. 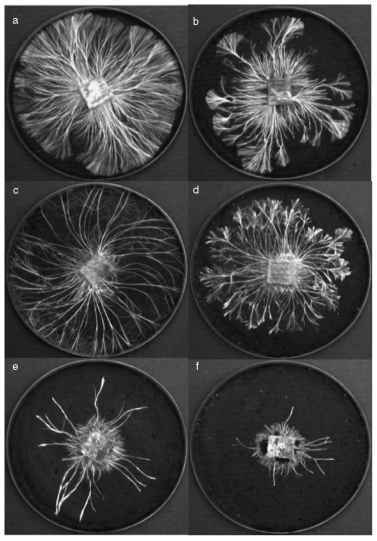 The mechanism behind changes in mycelial morphology following invertebrate grazing have not been investigated, but may result from removal of suppression of side branches when apically dominant hyphae are removed (Boddy and Jones, 2006). Mycelia are preferentially grazed in different regions depending on fungal species. Thus, with H. fasciculare there is preferential grazing of hyphal tips at growing margins; with R. bicolor there is indiscriminate grazing on cords and fine mycelium, but generally close to wood inoculum; and with P. velutina fine mycelium within the colony and hyphal tips at the growing margin (Tordoff et al., 2006). In larger mycelial systems, morphology and hyphal coverage of grazed systems was similar to that of ungrazed systems, apparently because the Collembola grazed on senescing hyphae that would ultimately have died (Wood et al., 2006). 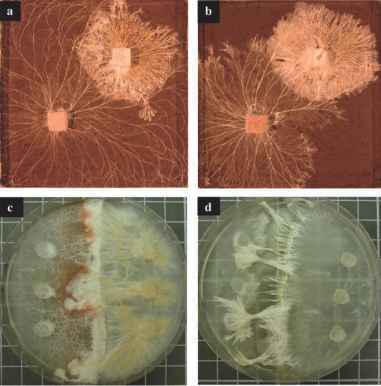 Figure 1 Effect of collembola grazing (Folsomia candida) on morphology of mycelia, growing from wood block inocula across compressed non-sterile soil in 13 cm diameter dishes. Hypholoma fasciculare ungrazed (a) and grazed by 20 collembola for 10 days (b); Phanerochaete velutina ungrazed (c) and grazed by 40 collembola for 10 days (d); Resinicium bicolor ungrazed (e) and grazed by 40 collembola for 4 days (f). Mycelia have been allowed to reach 8 cm diameter before collembola were added. From: Tordoff et al. (2006). than in the absence of grazing (Bretherton et al., 2006). In soil systems with high intensity grazing, there was catch-up or even over-compensatory growth following cessation of grazing, in some cases with almost 40% greater hyphal coverage (Bretherton et al., 2006). Such increased growth must be at the cost of more rapid use of the inoculum resource. Similarly, when leaf-cutting ants (that mutualistically cultivated Leucoagaricus gongylophorus) were deprived of leaves for 5 days they increased their rate of consumption of fungal staphylae, resulting in increased rates of staphylae production (Bass, 1997). This, in turn, resulted in more rapid substrate exhaustion. Little is yet known on effects of grazing on fungal physiology. This is obviously crucially important, particularly in terms of the ways and extent of reallocation of nutrients (Chapter 3). There is evidence of mineral nutrient release during grazing of litter colonized by the wood-rotting T. versicolor (Anderson et al., 1983). Also, enzymes associated with ligninolysis were switched on by P. velutina in the presence of the nematode Panagrellus redivivus (Dyer et al., 1992). Invertebrates can exert direct positive nutritional effects on Basidiomycota mycelia, through nutrient inputs in the faeces. Also, some Basidiomycota can supplement their nutrition by killing and subsequently utilizing invertebrates (see below).